S0558. 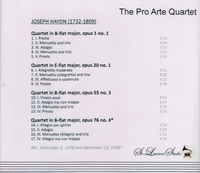 PRO ARTE QUARTET: Quartet in B-flat, Op.1, #1; Quartet in E-flat, Op.20, #1; Quartet in B-flat, Op.55, #3; Quartet in B-flat, Op.76, #4 (all Haydn). (Canada) St Laurent Studio YSL 78-114, recorded 1938. Transfers by Yves St Laurent.